Facility phone number: (415) 753-7098. 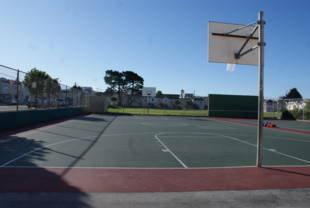 Located in the Outer Sunset District, near public transit, the Sunset Playground and Rec. Center features a baseball/softball field (kids 12 and under), a full basketball court, a volleyball court, and a kids' lot with a climbing structure and two swing-sets in a large sand box. There are 12 benches and three tables in and around the kids' lot, and there are restrooms on site at the north end of the rec. center. The rec. center contains an indoor basketball gym. 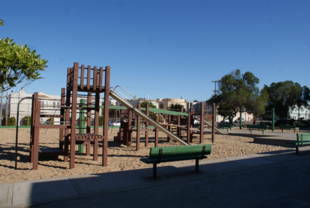 Sunset Playground and Recreation Center is owned by the San Francisco Recreation and Park District. In 1937, the three-acre site at 29th Avenue and Lawton Street was bought for $50,676 and began as a playground. Built by the Recreation Department and the W.P.A. (Works Progress Administration), Sunset Playground opened in 1940 with a small field house, volleyball, basketball and tennis courts. As the neighborhood grew and more children crowded onto the courts, neighborhood improvement clubs began to work for an expanded facility. 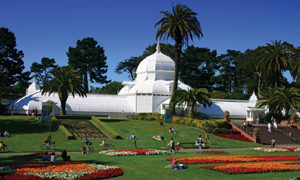 The Department chose a contractor to build Sunset Recreation Center and three other centers of similar architecture -- Ocean View, St. Mary's, and Potrero Hill. 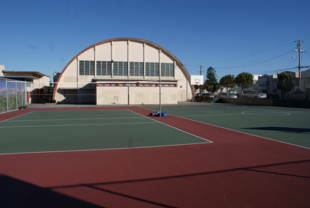 In October of 1951, Mayor Elmer Robinson dedicated the new facility at Sunset which now included two play areas (one for tots), new outdoor courts, a gymnasium, an auditorium, kitchen and clubrooms. The ceremony was followed by a tour of the premises, an exhibition game in the gymnasium, and dancing. And the broad smiles pictured on the faces of the mayor and civic leaders in the dedication photo might have related to the fact that the total cost of the project was $272,000. Activities for parents and children in the ' 50s reflected the era. Mothers' clubs of ten playgrounds sponsored benefit fashion shows at Sunset Rec Center to raise money for summer outings for their kids. Children from city playgrounds competed in a Story Play Contest, selecting a published story and turning it into a play with dialogue and action. Without script, narrator or costume, the story was told through the actors' speech and movement. In 1952, young Sunset thespians won first place. In those pre-video game years, the story play was seen as a way to stimulate creative self-expression among children. Twenty years later, Rec and Park's printed 'Datebook' lists such activities as 'Slim and Trim' physical fitness classes, badminton, table tennis, boxing and a senior program. Cut to the millennial spring of '03 and there's a 'sea change into something rich. . .' If Shakespeare had been describing the programs at Sunset Recreation Center when he wrote that, the name of Shawna McGrew might have surfaced in a sonnet. In her 16 years at the center, Shawna, now a principal supervisor, and the recreation directors have managed, inspired and assisted an astonishing variety of neighborhood groups ranging from toddlers to seniors, who stream to the center every day to pursue their special interests and improve their skills. A partial list of offerings includes Tai Chi, badminton, ping pong, ceramics (the center has its own kiln); Polynesian and Irish Line Dancing, yoga, quilting, cooking, and art classes. There's a food giveaway on the second Tuesday of the month. The ethnically diverse population includes Asian-Americans (mainly Chinese), Russians and other Caucasians, some Hispanics and African-Americans. Sports for youth take up the major portion of Recreation directors Steve Bell, Wayne Barry and Toby Wiley's time. In the basketball season, 39 teams from schools around the city are scheduled to play in the gymnasium every week. On an adult note, Shawna proudly says that the gym's cross-court was recognized in the book 'Hoop Nation' as 'the best pick-up court in the Bay Area.' (Ed. Note: In sports speak, a pick-up court is where athletes informally assemble for a game.) 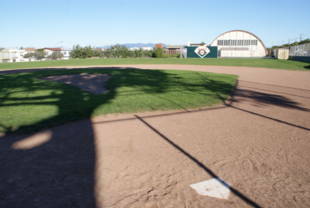 Basketball is also played on the outdoor courts as well as tennis and baseball and signups for teams playing baseball began on Valentine's Day (a special day helps players remember). The Sunset Neighborhood Community Board is made up of representatives from the area's ethnic organizations, fire and police departments, artists, merchants and politicos, including District 4's newly-elected Supervisor Fiona Ma. For Shawna, they represent an extended 'Friends of' group ready to help whenever she calls on them. Call the rec center for more information on activities they may offer (415) 753-7098.